Valley Cottage, United States - January 15, 2019 /MarketersMedia/ — Expanding at a robust growth rate of 6.8 percent, the global demand for bulk chemical packaging is estimated to reach a valuation of approximately US$ 10.7 Billion, in 2019, as per a recently published study Future Market Insights (FMI) on the global packaging landscape for bulk chemicals. Bulk chemicals, also called commodity chemicals, have witnessed a surge in demand given its wide application in a host of end-use industries such as healthcare, food processing, construction, and automotive. - Growing adoption of better performing and cost-effective larger containers versus smaller containers having short service life along with increasing shale gas explorations in U.S apart from other gas drilling and refining activities will drive more investments in chemical production, thereby, increasing the demand for bulk chemical packaging products across the globe. - Intermediate bulk containers (IBC) and drums are expected to experience the fastest growth through 2019, as per the report, given its advantages of cost effectiveness and reusability. 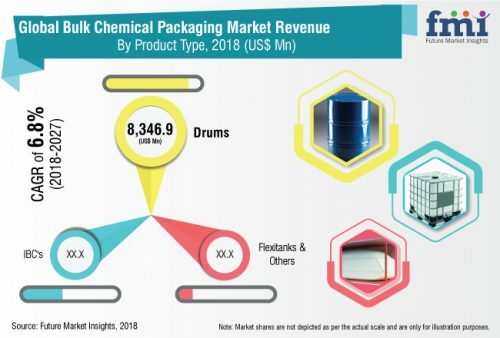 However, among the global bulk chemical packaging market's product type, drums will remain the most preferred packaging product, with nearly 83 percent revenue share. - The global bulk chemical packaging market is also reflecting product customization trends to suit the end-user requirements. Increased storage capacity, longer service life that allows large scale industrial customers to gauge the substantial long-term cost benefits, are some key considerations companies are making. - Apart from dimensions, companies in the bulk chemical packaging market are also offering light weight and cost-competitive products compared to the more conventional steel drums. In addition, material enhancements to make bulk chemical packaging products corrosion and impact resistant are also being deployed. - Bargaining power of suppliers is estimated to remain high considering relatively less number of packaging manufacturers compared to specialty chemicals manufactures. - Threat of substitutes will remain relatively low in the coming years, as IBCs and drums remain the most preferred products for bulk chemicals packaging. - Although the landscape is relatively fragmented, portfolio restructuring by key companies with dominant presence in U.S has created a highly concentrated structure, further intensifying the competition in bulk chemicals packaging market.